A trip to the Royal Court always offers a thought-provoking experience. Following their roots, with a commitment to giving space to new writing, Minefield was an engaging addition to their daring and innovative season of new work. 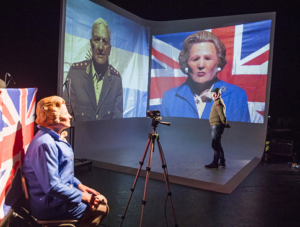 Utilising a Brechtian aesthetic, Minefield is a fascinating evening of storytelling, bringing the personal experiences of Falkland’s War Veterans to larger provocations around war, death and the choosing of sides. 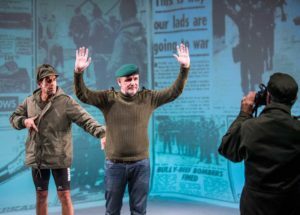 Minefield brings to life the stories of six Argentine and British veterans who, working closely with playwright and director Lola Arias, developed the piece in a rehearsal period lasting longer than the Falklands war itself. The piece allows them to come to perform their own stories in collaboration with LIFT festival, an organisation dedicated to bringing global stories to the London stage. Over the course of 100 minutes, the veterans lead us through their experiences of war; the before, the events themselves and the aftermath of their involvement. Playing themselves, the cast recreate scenes from their experiences live on-stage through a mixture of live music, foley-like sound effects, live camera feeds, projection and multi-roling. This theatrical conglomerate creates a playful atmosphere; all theatrical machinations are exposed, removing emotionality from the recreation of their memories and allowing the audience to understand their stories in a wider, and less emotionally exploitative, context. The sketch-like format covers a mix of the cast’s own personal memories, factual information, socio-political contexts and object-driven scenes, but for me, the most powerful element of the piece came in the form of the live music played by the cast, which allowed rawness and emotionality, without sensationalism. The piece begins by definitively dividing the cast along lines of country and language; the British versus the Argentines. This is reflected throughout the piece in the language barriers between the cast themselves, half speaking only Spanish, half speaking only English, and surtitles frame the stage to both demonstrate and undermine this linguistic barrier. 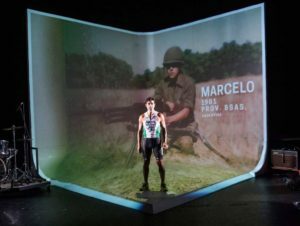 But as the piece continues, it is the disintegration and blurring of this division that lends poignancy to both their experiences of war and their present attempt to reconcile difference through theatre. An informative and interesting insight into an often overlooked area of history, Minefield deals with a challenging subject in a new and interesting way, coming to epitomise cultural divisions at the forefront of British politics and encouraging us all to reconcile around broader and more human commonalities.